Enforcer is not a typical 40k book. There are no space marines, aliens, battlefields — the standard fare for the darkness of the 41st millennium. 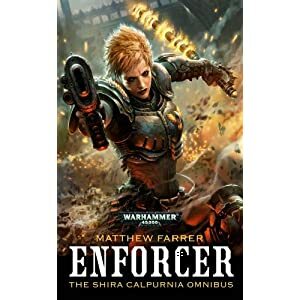 Enforcer is also not a stand-alone novel, but an omnibus edition capturing all three novels of the Shira Calpurnia trilogy into one volume. The three novels are Crossfire, Legacy, and Blind. I somehow missed these when they were initially printed. I had heard quite a bit of positive discussion concerning them, so when I picked up my copy I dug right in. The focus of these books is on Shira Calpurnia a senior member of the Adeptus Arbites. The Arbites are responsible for enforcing the laws of the Imperium across the galaxy. The best comparison to the arbites outside of 40k would be Judge Dredd. Depending on the situation, an arbite could be judge, jury, and executioner. Intimidation and brute force are the means by which they get the job done. Each novel within the collection is a pivotal case in Shira’s career. The stories are very different from each other so I will only describe them in the briefest of terms to avoid any spoilers. Crossfire is a detective story swept up in a mess of political intrigue; Legacy is a tragedy brought about by greed and the worst sort of backstabbing imaginable; Blind is a murder mystery involving a strange place and even stranger people. Despite these stories being very different from each other, a singular theme pulls them together. From the moment the first novel begins to the last scene in Blind, Shira adapts to a wide variety of new and uncomfortable situations. A trans-galactic move to her new posting (which is an absolute mess of political strife and odd cultural practices) concurrent with a promotion to relatively high office is just the beginning of the adjustments the character goes through. She is one woman alone in a sea of change, yet continues to forge her way forward in devotion to her duty. Shira Calpurnia is easily the strongest female character featured in such depth by the Black Library to date. 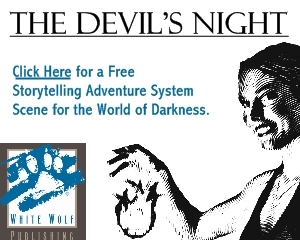 She is a strong protagonist and easy to identify with for the reader. Despite not changing a whole lot, there is a surprising amount of character growth packed into her stories. Overall, she is a well-executed and entertaining character. Matthew Farrer is an outstanding world builder. The settings for these stories and the institutions featured are well thought out and highly detailed. Farrer should be applauded for the depth and refreshing level of complexity, he has applied to the setting. When compared to the bulk of stories written within the Warhammer 40k setting, Enforcer is just different. The protagonist, level of complexity, and focus of these novels are outside of the norm. Enforcer is very much a unique experience. When compared to the majority of 40k novels, these particular stories are a bit light on the action. The lack of action combined with the level of detail present is not friendly to casual fans or readers new to 40k. There are also issues with the pacing of events in these stories. Legacy and Blind are particularly slow to develop. The high level of detail packed within these novels is partly to blame and may have been a bit overdone. The bonus material included with the omnibus is not entertaining. Each novel is followed by case documents, items like detailed letters and official reports. While another fine example of the care and detail the author wrote these novels with, they are not fun to read. I slogged through, but was not impressed and felt like the space devoted to the bonus material could have been utilized much more effectively. Enforcer is an interesting read for fans of Warhammer 40k. 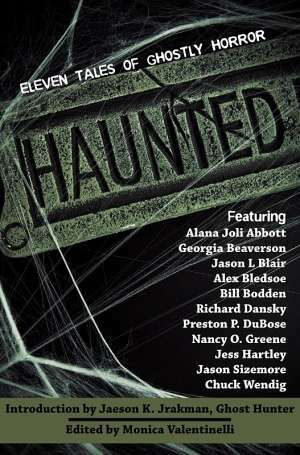 It boasts stories and characters unusual for the setting. Matthew Farrer’s prose is well written and bursting at the seams with a staggering level of detail. Shira Calpurnia is easily the strongest female protagonist featured within 40k to date. However, Enforcer is not easily accessible to casual fans or readers new to the setting. Action is a bit sparse and the pacing can be slow at times.